Highsteppers at Blythview07977 196156work Self-cateringSituated just a mile off the A12 and the pretty, unspoilt village of Blythburgh, with its famous 13th C church, the location of Highsteppers is ideal for picturesque seaside venues of Southwold, Walberswick, Dunwich & Snape Maltings and the RSPB bird reserve at Minsmere as well as inland Framlingham, Laxfield, Halesworth and Saxmundham. There are amazing views over the Blyth Valley from the lounge and bedroom windows. A private Leisure centre for owners and guests of houses and apartments at Blythview includes a good sized shared, heated, indoor swimming pool, a mini-gym and a games room. This 4* accommodation is arranged on the 1st & 2nd Floors of a magnificent Georgian building that was originally a workhouse. It offers spacious accommodation for 4 people and a sofabed in the lounge can sleep a further 2 people for a few nights. Furnished to a high standard, with full gas central heating, the accommodation comprises a large, fully equipped kitchen, a lounge diner, two double bedrooms - one with ensuite shower room and a separate family bathroom. Parking is available in the courtyard by the entrance to the apartment and there is further parking at the back. Please note there are unfenced canals in the communal grounds, so the property is not ideal for toddlers and young children. Highsteppers at Blythview offers weekly bookings starting on Saturday. 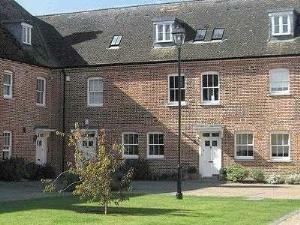 A 2 bedroomed apartment on the first and second floors of an historic building. Includes all heating, hot water, linen and bathroom towels. Highsteppers offers weekly bookings starting on Saturday. Situated just a mile off the A12 and the pretty, unspoilt village of Blythburgh, with its famous 13th C church, the location of Highsteppers is ideal for picturesque seaside venues of Southwold, Walberswick, Dunwich & Snape Maltings and the RSPB bird reserve at Minsmere as well as inland Framlingham, Laxfield, Halesworth and Saxmundham. Many of our guests return on a regular basis as they find the location so peaceful and convenient. The Leisure centre is about 100 metres walk from the apartment. Children welcome from any age. Blythburgh Village is on the A12. Just north of the White Hart Pub (on your right) take the A145 left signed to Beccles (you can see the Blyth estuary on your right). Then immediately take the B1123 signed to Halesworth. The driveway entrance to Blythview is about half a mile along this road on your left. If you get to the Queens Head pub at Blyford you have gone too far!